Throughout the winter season, village crews conduct a coordinated effort to keep roads clear of snow and ice, and safe for travel. During a snowstorm, crews concentrate on clearing the primary thoroughfares and highly traveled intersections. Please be advised that once two inches (2") of snow has accumulated, the village's parking ban goes into effect. The village has seven snow routes, with equipment assigned to each route. As crews clear the streets, snow and ice from the road are inevitably pushed back into driveways and other property entrances. Unfortunately, this is an unavoidable aspect of snow removal operations. We realize this can be an inconvenience to residents and business owners, especially after considerable time and effort have been spent in clearing driveways. Village crews will work to minimize snow and ice deposits in excess of those normally encountered during snow plowing; however, they cannot return to spot plow individual driveways which have had snow plowed into them during normal plowing operations. Please keep in mind that Village Public Works crews only plow streets owned and maintained by the Village. Rt. 30, 31 and Rt. 25 are state highways which are maintained by the Illinois Department of Transportation (IDOT). Notification regarding snowplowing complaints or pot holes on these roads should be made to the IDOT Communications Center at 847-705-4612. They have the ability to contact personnel for needed maintenance or repairs during working and non-working hours. For claims of damage that have occurred on state highways, please contact IDOT’s claims department at 847-705-4062. Likewise, some roads are owned and maintained by the county. Orchard Road (north of Route 30) and Montgomery Road are under the control of the Kane County Division of Transportation. Orchard Road (south of Route 30) and Galena Road are controlled by the Kendall County Highway Department. The Village takes responsibility for mailboxes that are physically hit by plows/trucks, whereas weak or deteriorated mailboxes that fall over due to the clearing of snow are considered to be a maintenance item for the property owner. The village surveys the plow routes each fall to evaluate potentially weak or deteriorated mailboxes, and letters are mailed out to each of those addresses, requesting that they be secured or replaced prior to the winter season. If you are unsure how the mailbox became damaged, please call public works, Monday-Friday, 7 am to 3 pm (excluding village holidays) for a supervisor to evaluate it. If you are putting up a new mailbox or replacing your existing one, please note that USPS standards require the mailbox to be set back between six to eight inches from the front face of the curb or road edge to the mailbox door. 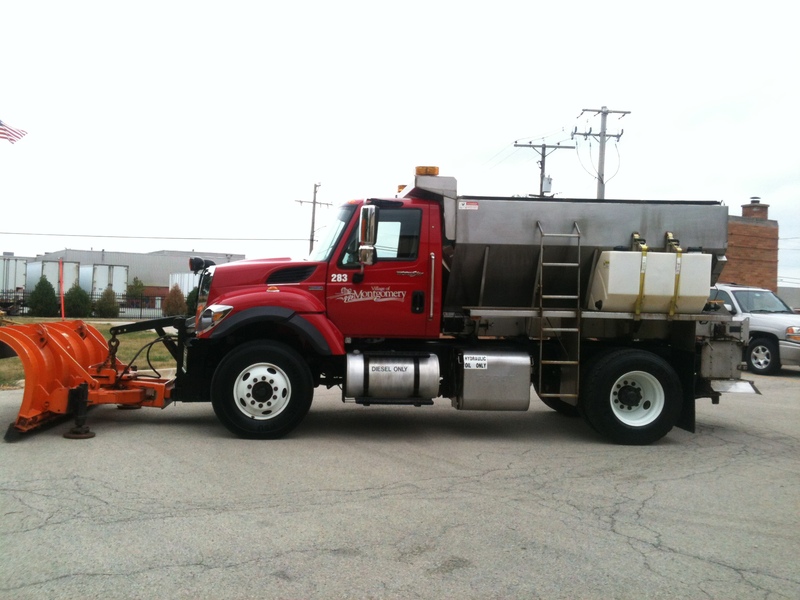 In the 2015-16 snow season, the Montgomery Public Works Department began a very successful anti-icing program that utilizes far less chlorides. By making a home-made salt brine solution with rock salt and water, we are producing a very low-cost 23% solution of salt water. This product is then applied with a sprayer unit mounted on the back of a truck at a rate of 40-60 gallons per lane mile. By pre-treating the roads with this very diluted product, we are able to save substantial resources in labor, fuel, wear and tear on equipment, and salt consumption, all while using salt more sensibly and providing a less impactful environmental change to the river and waterways. This program, while recently established in Montgomery, is a tried and true method of improving safety on our roads during a winter storm. This technology has been employed and refined by various public and private agencies over the past decade and a half. This solution can be applied as many as three days prior to a forecasted snow event, so workers may at times start a couple days before the predicted storm in order to maximize our coverage areas and reduce overtime. 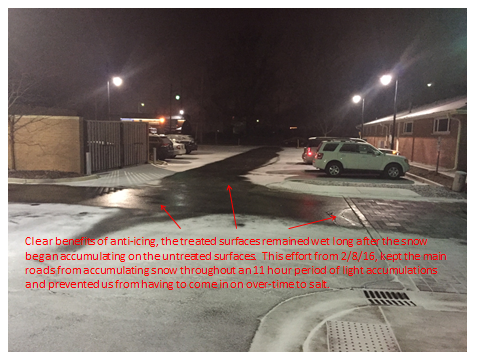 The photo below shows the effects of areas that were pre-treated prior to a snowfall. Please click the link for additional information on residential anti-icing and what you can do to help.